BOULDER, Colo. ? Call it Operation: Plymouth Rock. A plan tosend a crew of astronauts to an asteroid is gaining momentum, both within NASAand industry circles. Not only would the deep space sojourn shake out hardware, itwould also build confidence in long-durationstints at the moon and Mars. 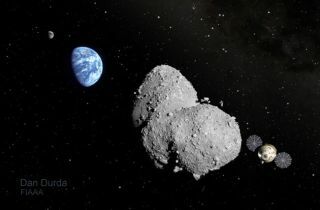 At the same time, the trek would sharpenskills to deal with a future space rock found on a collisioncourse with Earth. In Lockheed Martin briefing charts, the mission has beendubbed ?Plymouth Rock ? An Early Human Asteroid Mission Using Orion.? Lockheedis the builder of NASA?s Orionspacecraft, the capsule-based replacement for the space shuttle. Study teams are now readying high-level briefings for NASAleaders - perhaps as early as this week - on a pilgrimage to an asteroid, alongwith appraisals of anchoring large, astronaut-enabled telescopes far fromEarth, a human precursor mission to the vicinity of Mars, as well as aninitiative to power-beam energy from space to Earth. The briefings have been spurred in response to the recentReview of U.S. Human Spaceflight Plans Committee and the option of a ?FlexiblePath? to human exploration beyond low-Earth orbit. On this path, the committee suggested, humans would visitsites never visited before and extend U.S. savvy in how to operate in space -while traversing greater and greater distances from Earth. The merits of a human mission to a Near Earth Object (NEO)were detailed here Nov. 18 during a two-day meeting of the Small BodiesAssessment Group, SBAG for short. SBAG was established by NASA in 2008 to identify scientificpriorities and opportunities for the exploration of asteroids, comets,interplanetary dust, small satellites, and Trans-Neptunian Objects. The groupalso provides scientific input on the utility of asteroids and comets insupport of human space activities. The new studies are viewed as an iterative process - to beweighed both by NASA and the White House, said Paul Abell, a research scientistat the Planetary Science Institute detailed to the space agency's Johnson SpaceCenter in Houston, Texas and working in the Astromaterials Research and ExplorationScience Directorate. ?It?s going to take a bit of time. I don?t think there?sgoing to be a quick decision.? How the White House will react to a human trek to anasteroid is beyond anybody?s crystal ball. However, undertaking the effort hasgarnered the attention of Lockheed Martin - builder of the space shuttlereplacement - the Orion spacecraft. The Plymouth Rock mission study began a couple years ago,said Josh Hopkins, in the advanced programs for human space flight division atLockheed Martin Space Systems Company in Denver, Colo.
?We have been looking at what other interesting sciencemissions could be done with Orion?and asteroids were one of the ideas thatpercolated to the top,? Hopkins told the SBAG attendees. He made it clear thatthe firm?s study was done using corporate funds and doesn?t imply that NASA hasendorsed company results. Initial looks at the NEO venture involve the coupling oftwo Orion spacecraft. In this situation, a two-person Orion would link up with anunpiloted sister craft that?s loaded with extra fuel, food, water, and oxygen.It would be tossed into orbit - as well as an Earth departure stage - by NASA?splanned Ares V heavy-lift booster. While detailed NASA and industry looks at the makings of aNEO mission are still in play - including use of inflatable modules to add crewvolume - ?it?s an attractive option,? Hopkins said. ?It?s really a goodmiddle-step between the moon and Mars.? However, maximizing astronaut safety, dealing with suchthings as trash management, cosmic rays, sketching out abort scenarios muststill be addressed, Hopkins noted. But given the core attributes already builtinto the Orion system ?we think it does make sense for the human spaceflightprogram to be investigating this,? he said. Between NASA and industry looks, the flight of astronauts toa NEO could occur in the 2020 to 2025 time period. The round-trip mission wouldtake some six months. There would be no landingon the asteroid. Rather, they would park in close proximity, then jetbackpack onto the object. Once there, science gear would be deployed as samplesof the space rock are gathered ? on the order of a couple hundred pounds (100kilograms). ?We assume staying at the asteroid for five days. They couldstay a week or two. But staying for a month gets hard,? Hopkins explained.While on duty, astronauts would engage in gathering data useful to understandthe internal makeup of the asteroid. That, in turn, is solidly helpful, headded, in dealing with harmful space rocks on a worrisome trajectory dangerousto Earth. Today, there are a handful of candidate asteroids that couldbe visited a couple decades from now, said Clark Chapman, an asteroid expert atSouthwest Research Institute here in Boulder. That number will grow as moreground and space-based instruments come on-line, surely increasing thediscovery rate of NEOs, he stated. ?We?d really like a larger pool of candidate targets so thatwe could visit a NEO that has cool properties and would have the greatestscientific return,? Chapman told SPACE.com. ?Human exploration is for human purposes,? said Mark Sykes,chair of the Small Bodies Assessment Group. He is also director of thePlanetary Science Institute in Tucson, Ariz .
Science by itself doesn?t drive human exploration, Sykesnoted, ?but we can benefit, scientifically, from this. We?ll take advantage ofwhatever opportunities come our way!? Sykes said that he had briefed the committee that conductedthe recent review of U.S. human spaceflight plans. Specifically, Sykes said that he underscored the prospectthat NEOs represent a location of resources that could have a profound impacton expanding sustainable human operations beyond low Earth orbit. They could bea well spring of water, he added, as well as useful for life support andradiation shielding. If so, asteroids may well act as a lynch pin for peopleliving, working and populating space, Sykes suggested. But are those resourcesrecoverable in an economic way? ?It?s within the realm of consideration. Of course, a lotmore homework needs to be done,? Sykes stressed.